Caldera is an Imperial charter town just north of Balmora. It was built to service the nearby ebony mine, providing the miners with homes, entertainment, and other services. The town is ruled largely from the Caldera Mining Company's fortress to the northeast. The buildings, which have Imperial and Nordic architectural influences, form an inverse "L" shape between two large guard towers. 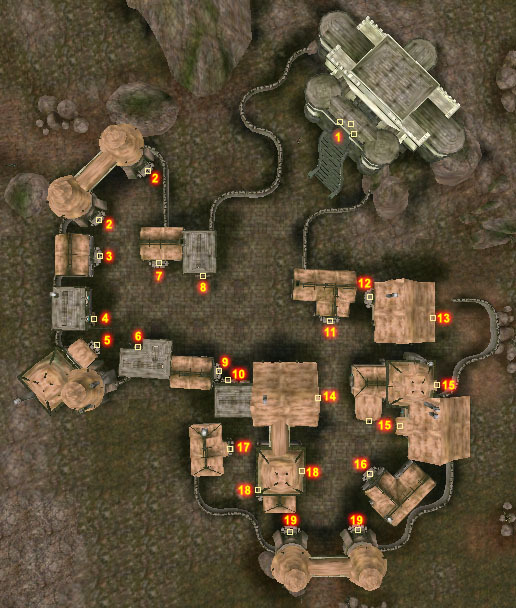 While Dunmer presence in Caldera is almost non-existent, a large contingent of Orcs live in the dilapidated Ghorak Manor (along with an unusual Scamp who is a merchant and claims the house is his). 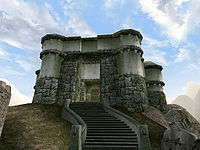 Notable institutions in Caldera include an Imperial Cult altar, a Mages Guild branch, two general merchants, a blacksmith, a tavern, and one of the few Imperial-style clothiers in Vvardenfell. Located to the north on a hill overlooking Caldera, the Governor's Hall is the residence of a corrupt House Hlaalu quest giver, Odral Helvi. You find several Hlaalu trainers here as well as Foves Arenim selling thieves tools. Llaros Uvayn sells some interesting spells. 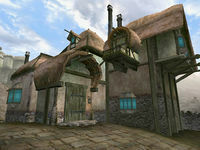 Ghorak Manor houses Creeper and Duma gro-Lag, a sculptor that can help you in a quest for Boethiah. The Mages Guild offers Enchanting and Emelia Duronia is the guild guide here. Surane Leoriane offers some training to other Blades and has a bed you can sleep in, behind a locked door. The local inn, Shenk's Shovel, offers sundries and beds. The smith Hodlismod in the alley by Ghorak Manor sells quality weapons and armor, especially if you have the official Adamantium Armor plugin. The pawnbroker Irgola has a Shadowweave Ring and the Hlormaren Propylon Index for sale. The trader Verick Gemain offers some useful enchanted items for the budding adventurer. Ri'Shajirr is a master trainer in Sneak, located upstairs in Shenk's Shovel. Governor Odral Helvi is a quest giver for House Hlaalu. The mine boss Stlennius Vibato lives in the Caldera Mining Company building at the ebony mine. For a complete list, see People in Caldera. Apart from the guild guide, there is no fast travel from Caldera. Good roads lead south to Balmora and north to Ald'ruhn, which are fairly close by. The north road has a minor path leading around the mountains to the Caldera Mine and a Y-split, with a minor road leading west to Gnaar Mok on the Bitter Coast. The Foyada Mamaea is east of town, leading to Ghostgate and Red Mountain. If you have the official Master Index plugin, Caldera can be your hub for travel to the whole island. You can steal a full set of master alchemy apparatus in the Guild of Mages, sitting unguarded behind a wooden door. Just don't try to sell it to Ernand Thierry, because it is his. The Indalen Ancestral Tomb has leveled, respawning Daedra for good loot, just a few steps away from Creeper. The Caldera ebony mine is straight southwest over the mountains, or follow the signs exiting the north gate. Abaelun Mine is the only working diamond mine on Vvardenfell.